A Mom In The Making: Eat A Frog! Sounds like a fabulous book... I immediately requested a copy from the library... and it sat on the self for three weeks collecting dust and now its back at library land. However my friend gave me the short and sweet and it changed the way I think about things. The concept is that you begin with the task you are avoiding... then things only get easier from that point. I hate frogs... sometimes I spend days or weeks hopping from one task to the next to avoid something I don’t like doing. 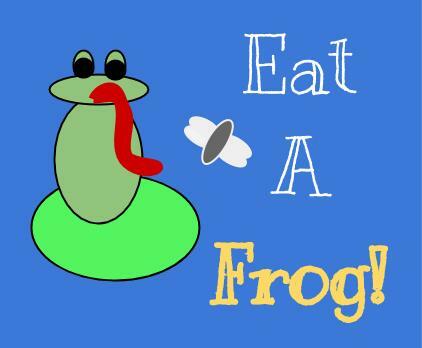 However the days I buckle down - plug my nose, squint my eyes and swallow the squirmy little frog are the best! I am exponentially more productive and feel great at the end of the day! What is your frog? Are you ready to swallow it? Oh, I love that! My frog is (and has been) cleaning my barn. Right now it's a little like eating an elephant...you have to do it one bite at a time. ;) It's slowly getting done, but I usually put it off until later in the day and run out of time to get too much accomplished. Maybe if I started working on it first thing in the morning I might actually make some headway. Finding a cute modest swimsuit!